© Arthur Levine, 2007. Licensed to About.com. Special note: The Let the Memories Begin event and features were available for a limited time in 2011 and 2012. The following information is about the program when it was operational. Disney no longer offers Let the Memories Begin. Theme parks are, at their core, highly social experiences. Sure, they are filled with scream-inducing thrill rides, eye-popping dark rides, and a host of other wild attractions designed to stir the senses and deliver fun. But at least half the fun is in sharing the screams, thrills, and fried dough with friends and family. The shared experiences at a theme park can become treasured memories that endure long after the park's twinkling lights fade into the distance. Disney understands this. That's why it is focusing on memories as the theme for its 2011 and 2012 promotions at Disney World and Disneyland. Called "Let the Memories Begin," the US parks are giving visitors an opportunity to share their Disney memories--in a big way. Throughout the event, Disney will collect videos, photos, and stories from guests, both at the park and online. Chosen submissions will be posted to the Let the Memories Begin website. Selected photos -- and here's where it gets interesting -- also make their way into a nighttime show that is presented at both Disneyland park and Walt Disney World's Magic Kingdom. Up to 500 photos a day are projected onto Cinderella Castle at the Magic Kingdom and the whimsical structure that houses the it's a small world [sic] attraction at Disneyland. The images are featured in the show along with a new song. A new batch of images are used each day. The show also includes some of Disney's traditional pixie-dust production value along with some heart-tugging moments. In addition to the online and in-park exhibitionism, visitors can have their memories broadcast as part of a series of television ads. Disney is using the guest-generated content for its campaign to drum up business for the parks. In the early weeks of 2012, the resorts will also be presenting One More Disney Day. Learn how Disney will be celebrating leap year by keeping its parks open for a 24-hour marathon. Plus it will be giving away vacation packages and offering a buy-three-nights, get-one-free hotel deal. In addition to all the great things going on at the Disney parks, you can find out about other exciting developments in what's new at California theme parks for 2012 and what's new at Florida theme parks for 2012. How Do I Share My Disney Memories? Guests can also submit their images, videos, and stories online at the Let the Memories Begin website for consideration. Read about the new Pixar land and other park upgrades. 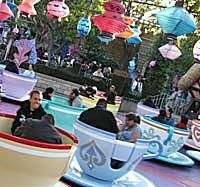 Read about the ongoing Fantasyland expansion. See the latest hotel opening at Disney World. Read my review of the revamped attractions at Disney's Hollywood Studios in Florida and Disneyland Park in California. Read my review of the new ride at Disney California Adventure (and coming to the Magic Kingdom in Florida).